Home > MF - Balance Funds > UTI Balanced Fund - Generated a return of 15.80% on CAGR basis since its inception. UTI Balanced Fund - Generated a return of 15.80% on CAGR basis since its inception. The investor’s preference for different asset class keeps shifting based on market actions. Some time investors may be overexposed or underexposed to a particular asset class leaving the portfolio open to market’s unpredictability. Therefore it is important to balance it out to keep one’s portfolio well allocated among debt, equity and other asset classes. 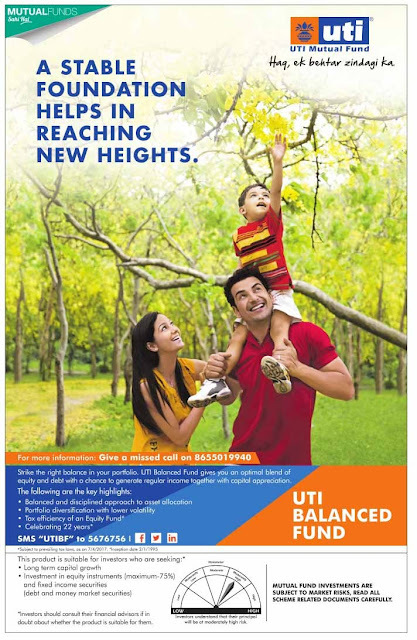 Launched in 1995, UTI Balanced Fund is a key offering in balanced category. The fund aims regular income together with capital appreciation by following a disciplined and balanced approach to asset allocation. The fund is managed with an equity tilt and the entire alpha is generated out of equity portion. The debt is managed on a conservative basis and is invested mostly in long term corporate bonds. The fund manager avoids taking allocation calls between equity and debt unless there are very strong signals of equity under performing by a wide margin. Historically, the equity is closer to the maximum level of 75% while in debt segment the fund focuses on corporate bonds of maturity of two to three year. On a tactical basis, the fund takes exposure in G-Sec to the extent of 20% to 30% of the debt portfolio in case of fund house’s view is bullish on G-secs. Currently, the fund has around 60% weight in large caps and balance in mid and small caps and would aim to maintain this weight. The fund would strive to derive alpha from the investments in mid and small caps. In terms of mid caps, the major sectors where the fund is invested are IT, Utilities & Chemicals. · 23 years track record - The fund has withstood various market cycles over 23 years. It has outperformed its benchmark (Crisil Balanced Fund Index) on 1/3/5 year time periods. The fund has generated a return of 15.80% on (CAGR basis as on Dec 29, 2017) since its inception. · Dividend Distribution Track record - The fund maintains a good dividend distribution track record. The fund has declared regular dividend since 2003 (except 2013). Since March 2017, the fund has consistently declared monthly dividends to the investors, thus providing periodical income from their investments.